Are you READY FOR ADVENTURE? 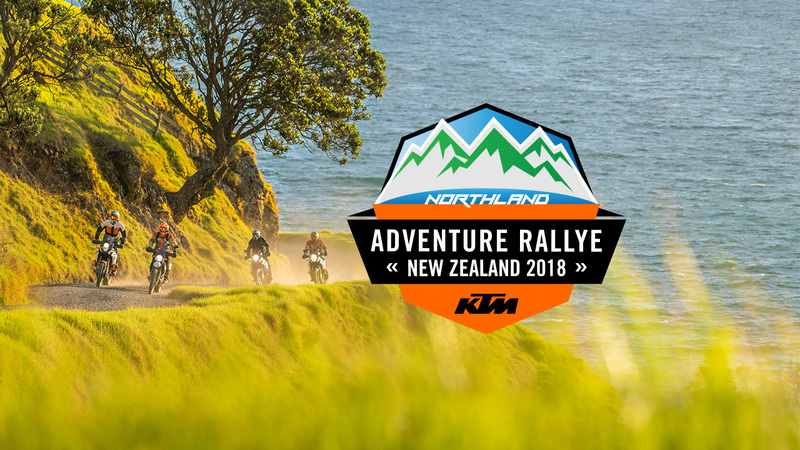 KTM New Zealand is proud to announce our third annual KTM New Zealand Adventure Rallye: Northland 2018 to be held from Friday 30th November to Thursday 6th December! For 2018, the Rallye returns to the North Island and takes the Rallye concept to another level with six action packed days of adventure riding, exclusive private land access that will give riders some of the most incredible terrain we’ve ever had on a Rallye, and a new initiative for 2018 with the introduction of the KTM Ultimate Race Qualifications! The adventure starts in the iconic Bay of Islands, which features the historic Waitangi Treaty Signing grounds and the first governors residence Maori Waka. The dates of the event have been planned in line with the tides to maximise the best riding opportunities Northland has to offer. White sand beaches, gum fields, Kauri Kingdom forests, pine forests and the famed hard black sand Ninety Mile Beach – all in the first few days! After two nights in Taipa Beach, the route then sees riders heading back through Whangarei to Chris Birch’s backyard, where the final two days will be held on the Coromandel Peninsula with overnights in Thames, Coromandel Town and the final stop in Whangamata. Open to Orange Adventure Riders with the following eligible KTM bikes: 640, 690, 950, 990, 1050, 1090, 1090R, 1190, 1190R, 1290 & 1290R models. Designed with the V-TWIN KTM range in mind, the aim of the KTM New Zealand Adventure Rallye is to be suitable for all KTM adventure riders. Therefore this year the Main Route will be shorter and less technically challenging than previous years routes, made up of winding back country roads, gravel roads and some easy, well-formed off road tracks. Don’t think for a second that we are going soft though! The Breakout Route options will have some serious riding and riders can expect sand, mud, hills, mountains, farm land and some real challenges – with our first ever 4 Chili options for the truly brave. The KTM New Zealand Adventure Rallye is about offering a great experience to our ORANGE adventure riders – and what better way to do that than with an epic 6-days exploring the best that the stunning Northland and Coromandel regions offer, on your KTM adventure bike. Bring old friends or make new ones, in the spirit of adventure riding, the Rallye is about getting back to the basics. A new initiative has been introduced to bring together the global KTM Adventure Rallye communities. With six KTM Adventure Rallye events now taking place all over the world, in 2018 two lucky Rallye Riders from each country will qualify to take part in the KTM ULTIMATE RACE . . .
That’s right – 12 lucky Rallye Riders will win the opportunity to race each other in a Dakar Series event at the Merzouga Rally 2019 in Morocco! The fully supported ride for each person includes flights, accommodation, entry fees, as well as a KTM 790 ADVENTURE R to race on, with a full race service. AND – the winner of the KTM Ultimate Race will receive an incredible prize of a 790 ADVENTURE R and 2 VIP packages for the Dakar Rally! What does this mean for you? The KTM Ultimate Race Qualification is open to V-Twin riders on the 2018 KTM New Zealand Adventure Rallye. Meaning if you partake in the Rallye, YOU could be one of the lucky two New Zealanders who qualify for KTM ULTIMATE RACE! Registrations for the 2018 KTM New Zealand Adventure Rallye: Northland open Friday August 10th at 9.00am (NZST): CLICK HERE FOR MORE DETAILS & REGISTRATION PAGE.